A team consisting of three – Ryan Benjamin, Rebecca Xavier and I (Grace Albert) – departed the north savannas for our journey to the south savannas on the 1st December, 2018. Driving through the North Rupununi Wetlands left the feeling of going away for a while. Bearing in mind, we were indeed going to be away for about 20 days. The team overnighted in the township of Lethem to do our grocery shopping. 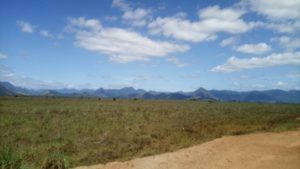 The next day, after lunch, we were picked up by Shulinab’s Village bus and we excitedly headed off through the vast south savannas with the Kanuku Mountains acting as companion off to our left. Our first community was Maruranau, located in the deeper south towards the eastern end of the Kanuku Mountains Protected Area. Once there we settled in under a great looking benab as the night was coming our way. But it was not time to relax as yet – we had to start organising a village meeting for the next day. Before bed time, we finally got to relax outside the benab where we viewed the brightly lit night sky. Personally, the stars we usually see near home…seemed so far off. I could imagine the distance we had travelled and the stars left behind too! As we settled into bed, there were many bats in the benab welcoming us to sleep soundly for the night – unless you are afraid of bats! On a very windy, bright and early morning, we awoke with the excitement to meet the Wapichans, especially Rebecca where it seemed like coming home. 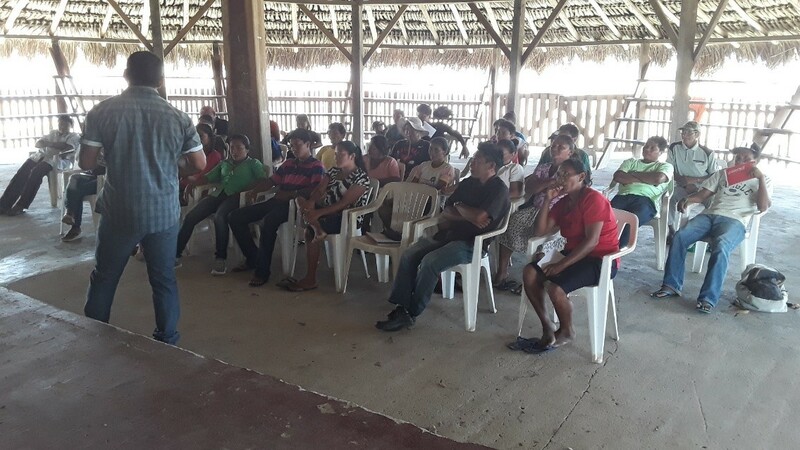 At about 8:30am, village members started to turn out for the community meeting and workshop. We were greeted by every single village member with a word; “kaimen!” meaning “greetings”, in English. The meeting was carried out in the morning period, where the project was re-introduced to the public and we explained what we were aiming to do during our visit. 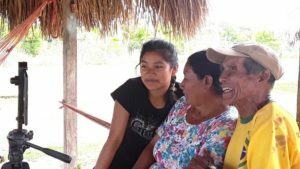 We were uncertain whether we were fully understood and it was pointed out that our video should have been in the local language. However, the Deputy Toshao – Ms. Teressa James, helped to translate our words into Wapishana. Village Councillor Ms Saydan Craft, stressed in her language the importance of the approach the project will use – the use of participatory video. She said “For me, I see this project is a great idea, it will help us the community as we are building on a village museum. Everything we document we can store it in there…Which will benefit our generations to come”. Over the course of two afternoons we had discussions on challenges related to traditional knowledge and examining the state of the knowledge for different indicators of community viability. Over the next seven days the team trained 7 young people; 4 females and 3 males, ages ranging from 18- 34 years, who were chosen by the villagers. The youths were very open minded, vibrant, brave and had a lot of interest in learning. 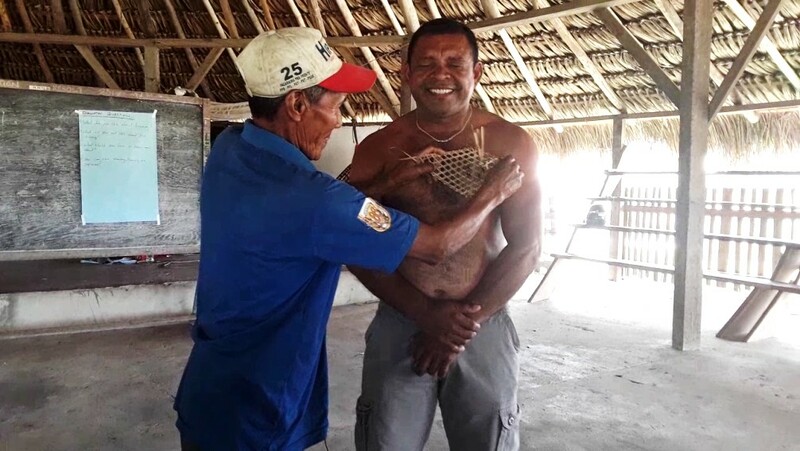 As part of their videoing exercise, the trainees organised a traditional activity with an elder in the village where he did an “ant stinging” exercise to demonstrate what they do when their young people come of age. As we preach and practise “participation” a team member had to participate. Ryan, who has never participated in such a ceremony was nominated to be the ‘initiated’! According to the elder, it was done to get the youths willing and to do work accordingly (do like the ants do in their colonies). The final night of our stay, we organised a screening of the videos the trainees had produced as well as those from other training sessions. We had a large turnout of approximately 100 adults, 40-50 youths and about 50 children. The children were so excited and they all enjoyed the videos we screened. During the short time we resided in the village of Maruranau, we (the team) experienced a lot of new things. In fact, we were warned when we first arrived that we should not leave clothes outside otherwise it will disappear. On the fourth day of our stay, two of the team members hung their towels outside. When we woke in the morning, they had disappeared, only to realise that the culprits were cows who love eating clothes! Of course through all the work to be done, we enjoyed the village and the friendships we were invited to form with the Wapichans. Witnessing the people, especially the youth converse so fluently in their Wapishana language has encouraged us, and Rebecca has vowed to use the opportunity to better learn the language becoming more in touch with her Wapichan heritage.